A fellow Philly Grubber had invited me out to dinner to welcome me back to Philadelphia. She suggested Azul Cantina on the corner of 10th & Spruce (across from Kanella’s), on the eastern edge of the Gayborhood. Mexican is not on my list of favorite foods because it often contains dairy products which are a no-no for me. When I think Mexican, I think swimming-in-cheese enchiladas or burritos. However, after peering at the menu online, I was pleased to see there was a good selection of dishes that even the lactose-challenged could enjoy. On my way there, my stomach began to feel upset. I took some pills and hoped for the best. I certainly didn’t want my stomach woes to get in the way of some good grub! When I got there, Infytur, seated outside with her sweet pooch Boaz, had already ordered a margarita since the early Happy Hour was in effect. I knew for a fact an alcoholic beverage was out of the question for me. So I explained to the waitress that I had a bit of upset stomach, she promptly recommended ginger ale and bitters. I don’t know if it was the pills I took or the ginger ale and bitters, but by the time the entrees had arrived my stomach was feeling just fine. 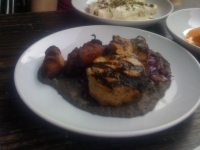 For starters, we ordered the traditional guacamole and grilled pineapple salsa. Both came with chips. The guacamole was tasty, but pretty standard in my opinion. To its credit, though, it was not overpowered by garlic. In fact, I don’t think it had any in it at all. The menu doesn’t list it as an ingredient either. That’s a good thing because of my mild garlic allergy. The grilled pineapple salsa was wonderful. You could really taste the cilantro, which I love! All in all, I felt we were off to a decent start. 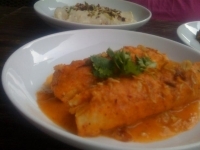 For the main course, we ordered and shared Mescal Brined Pork, Black Bean & Goat Cheese Enchiladas, and Sweet Potato Enchiladas. 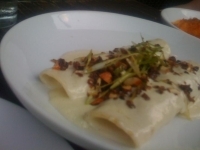 The Black Bean & Goat Cheese Enchiladas were very yummy, they were smothered with a spicy red sauce. The black beans were in tact and not mushy. The goat cheese (which I can have!) was a perfect pairing with the beans and helped “cool” down the spiciness of the sauce. I’m not a huge fan of spicy-hot foods, but this was just too tasty to not thoroughly enjoy. I took a big chance with the Sweet Potato Enchilidas – they were covered in a cabrales crema. In other words, a cheesy sauce. It looked too good not to sample! Delicate, light, and topped with mole-cured bacon and scallions, it was really, really good. Infytur suggested adding some of the spicy red sauce, which certainly added more flavor and dimension to it. We pretty much finished everything, except for a few bites of the spicy black bean enchildas. I was not going home right away, so I did not get a doggie bag for it. We perused the dessert menu, but everything pretty much had dairy in it. So we decided to stroll down to Capogiro for dessert. I’ll save that for another post, another time, though. 3.5 out of 5 Noms. Tags: enchiladas, guacamole, pork, salsa. Bookmark the permalink.